It’s no secret: Brand dollars are moving online faster than ever. 64 percent of marketers say they plan to increase their online brand advertising budgets in 2012, with 22 percent saying they will increase spending by more than 20 percent (source: Vizu|Digiday Survey: Online Brand Advertising Outlook for 2012). 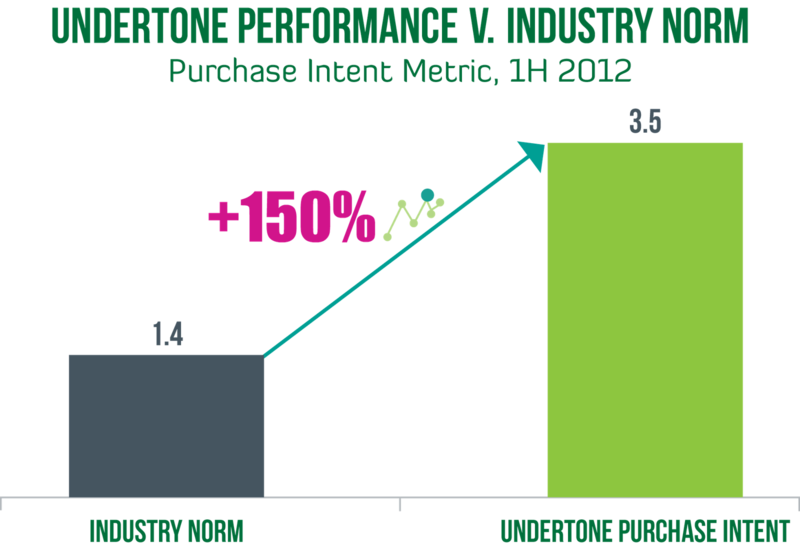 But how does this growth translate to performance and affect brand equity? Well, if you’re partnering with Undertone to deliver meaningful experiences online with our display, high impact, and/or video solutions then you’re seeing considerable brand lift. And because our advertisers have measured a variety of brand metrics in 2012 that literally span the entire purchase funnel, we took a deeper look into the data to find the following takeaways. Visualization of a product within ad creative has the propensity to create a longer lasting impression than messaging alone. 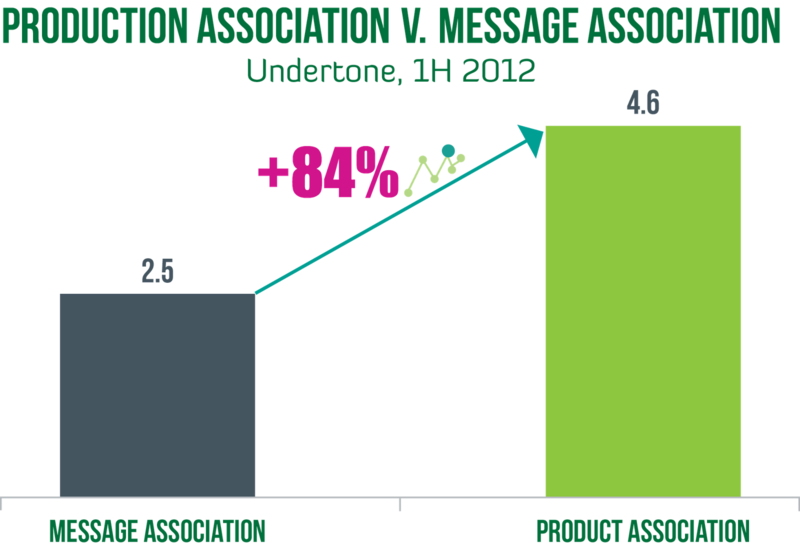 Many of our clients’ campaigns include message or product association goals and for good reason: Campaigns on Undertone in 2012 drove an overall lift in association 23% greater than the industry benchmark (Source: Vizu and Dynamic Logic MarketNorms, 2012). 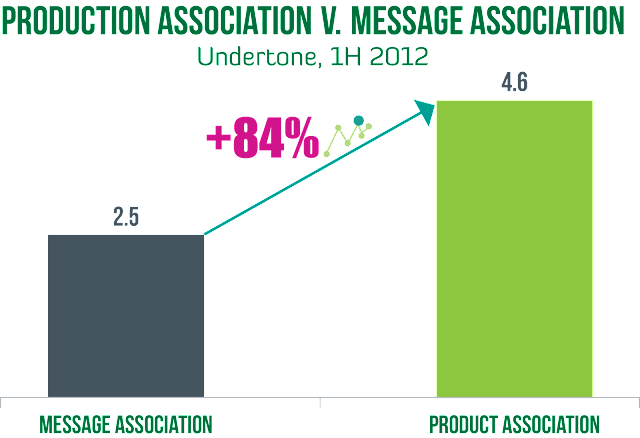 Among these association studies, we found that product association drove a lift 84% greater than message association metrics which clearly suggests that including a visual of a specific product in the unit has a significant impact. Impactful campaigns drive purchase intent in addition to upper funnel metrics. Another key finding from our first half of the year data was that the average purchase intent performance on Undertone is 150% higher than the industry norm (Source: Vizu and Dynamic Logic MarketNorms, 2012). Lifts in intent were seen across pretty much every vertical, including CPG, Food & Beverage, QSR, Travel and Lottery. Seven out of 10 of these studies included Undertone’s suite of high impact units, which tells us that impactful and engaging creative leads to increased purchase intent. And last but not least: If you want to see brand lift…Creative matters! After taking a closer look at not just the performance data but the creative executions as well – we saw that the highest performing campaigns’ creative effectively incorporated the message. Campaigns that did not see substantial brand lift had message or product association objectives but did not articulate messaging in the creative execution as strongly, making creative more important than ever. So what is the overall takeaway? Simple: That brand dollars spent wisely online can (and do) perform well for metrics that matter. With measurement in place, and optimizations ongoing, brand advertisers can have faith that their dollars will work harder and smarter for them online.